This is the weekend I wait for all year Veg Expo in Vancouver. I am vegetarian and love food so an exhibition where I can get all the vegetarian food I want for reasonable prices is great. I bought my tickets from social shopper which was 2 for $15 and with cash back from other sites it ended up being around $10. Tickets are well worth the price. A lot of samples in my tummy not sure if the bags that were given out earlier had more items in them. I was picking up a coupon from the table and the volunteer told me they were in the bag. I came home to discover there was no coupon in the bag but I still ended up with a pretty good free haul to bring home. 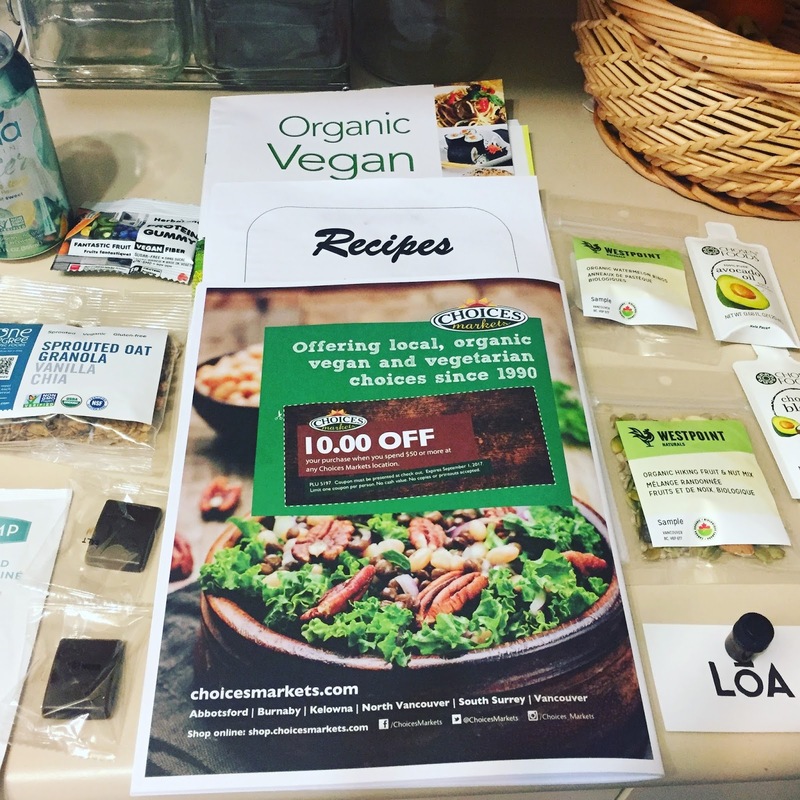 A couple of vendors had responded to my twitter or instagram inquiries and I have been to past veg expo's. I knew I would be stocking up on supplies while I was here and was prepared with cash. Although the venue was larger than past years the crowd also increased in the past it was held over two days. My companion for food events is always foodie buddy. 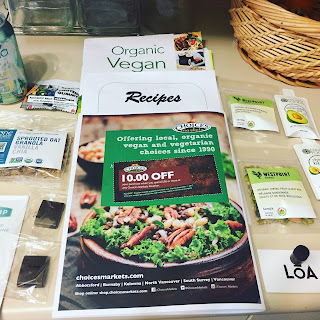 After a few samples at vendors I headed over to vegan supply I knew I wanted the jerky. The line was really long to eat their samples and then inside their store. Fortunately they had someone who could use the portable machine to ring in my transaction so I didn't have to wait in line. I bought 3 bags of jerky, bbq jackfruit, taco crumbles and vegan marshmallows from this vendor. Then we were ready to see someone on stage however the seats were full so we headed up another aisle for more samples. Tried a lot of Kombucha, Vegan cheese, and chocolate. I bought some chocolate. Vegan gummies are usually hard or expensive to find so bought some of those. Also bought some tea and later I bought some fresh best taco shells to have my taco crumbles in. Yam Chops is opening in Vancouver soon and I am so excited. The plant based butcher. We tried to visit their booth when they were on stage and there was too many people. I went back later and realized it was because they were sampling taco's while they were on stage. I bought some carrot lox and some coconut bacon. I have already eaten most of the carrot lox so good. I just ate it from the package as they break a bit when I take them out. If someone made me a bagel with this I would be happy. 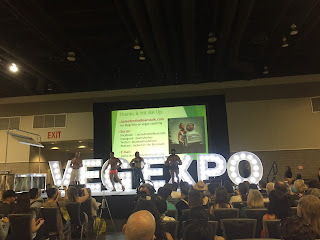 I didn't see many of the speakers but I did watch the muscles and learned about making kombucha. Also got to sit in a Tesla. We had a great time left with a full tummy and a lot of food to bring home. 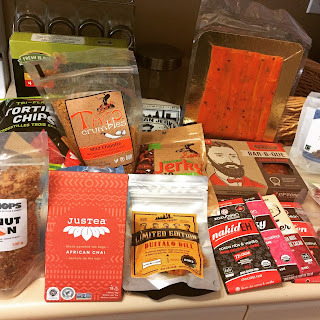 If you are wondering what foodie buddy bought this is what I remember Zmint chocolate, more chocolate, spices, coconut bacon, tea, and after buying 2kg of frozen goji berries it was time for us to leave and commute home before everything melted. Foodie Buddy says: Also got matcha powder and coconut oil. Nice photo of those vegan bodybuilders!